I want to thank you for your business over the years, and update you that I am no longer selling mushroom spawn, as I have moved to California for a PhD program in Environmental Science. Though I am no longer selling mushroom cultures, I will continue doing mycoremediation research, and offering education and workshops on topics related to mushroom cultivation, citizen science, remediation, permaculture and environmental toxicology. Luckily, you can still get spawn in Victoria! David Lyon is selling spawn, including spawn bags, grain spawn, liquid culture, and agar culture and potentially starter kits, buckets, woodchip patches or log installations. I am looking for 1-2 Victoria-based folks to help out with mushroom chores over the next few months. My proposed trade is for 20 hrs of work valued at $15/hr in exchange for a space in an upcoming weekend-long mushroom cultivation course (tentatively June 1-3rd) + spawn. Things I need help with include: gathering and prepping substrates (chopping straw, getting woodchips, prepping buckets and jars and cardboard), making airport lids and sterilizing needles/syringes for liquid culture, postering, organizing the cultivation space, and a bit of help with setup and takedown at the course. If you’re interested in learning to cultivate mushrooms for food, medicine and remediation, this will be a great supplement to the course as you’ll get embodied experience with the first key phases in mushroom cultivation. PM if you’re interested with a bit of info about yourself and why you’re interested, and your availability. Liquid Culture Sale & Medicinal Mushroom tinctures for sale! $10 for Reishi (Ganoderma lucidum) and King Stropharia (Stropharia rugoso annulata) liquid cultures. Winter is a great time to grow out cultures for spring installation. Also- support your immune system! $15 tinctures of Reishi I grew, and Turkey Tail, Red Belted polypore, Chaga and Artist Conk I harvested. Order by emailing diyfungivictoria@gmail.com or messaging to the D.I.Y. Fungi Facebook. Include your address for shipping. Pickup or drop off is available for folks living in Victoria. Fernwood Community Centre, 1240 Gladstone Ave. This course will introduce the art and science of mushroom cultivation by offering low-tech, home-scale methods for growing mushrooms for food, medicine and earth renewal. We will focus on less-sterile approaches to creating your own mushroom cultures (“spawn”), fruiting mushrooms for food and medicine, and working with fungi to build soil, boost your garden, and address soil and water contamination. Throughout this course, you will learn about setting up cultivation space at home, gathering materials and equipment, and gain experiential hands-on skills to make liquid cultures, petri cultures, grain spawn, sawdust kits, and more. You will learn simple ways to grow and make mushroom medicine, grow mushrooms in your garden, digest household waste with fungi, and work with fungi for remediation. Come to this day-long intensive to learn how you can grow nutritious, delicious and medicinal mushrooms where you live. We’ll overview basic fungal ecology- what you need to know to grow mushrooms successfully- and then delve into simple ways you can grow mushrooms in your home, garden and farm. 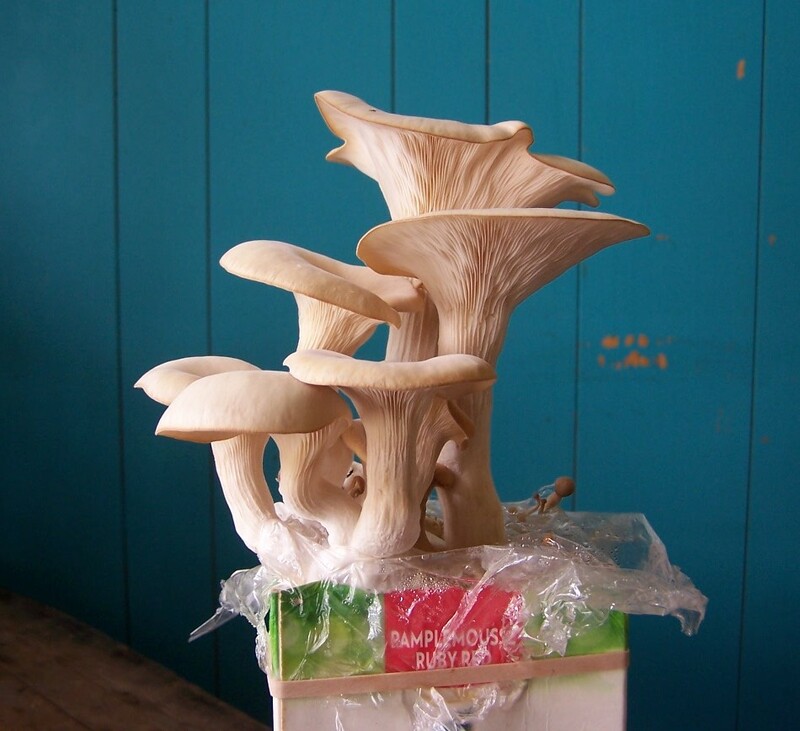 We’ll focus on the easiest mushrooms to grow- Oyster, Garden Giant, Shiitake and Lions Mane- and go through their nutritional and medicinal properties and ways to grow them. Then we’ll get hands-on experience making mushroom logs and mushroom beds in a food forest garden, as well as offering tips for companion planting mushrooms within veggie beds and orchards, mushrooms and composting, and the important role of mycorhizal fungi in the garden and orchard. Each partipant will make their own Oyster mushroom grow kit to take home. Participants will leave with two mushroom growing projects, detailed handouts, and an understanding other cool stuff they can do with their mushroom kits- from building healthy soil, exploring a small-scale myco-remediation project, to scaling up food and medicine production. Cost: pay-what-are-able but please give generously between $95-$125. Registration required. Please reserve your spot by contacting Danielle at diyfungivictoria@gmail.com to purchase tickets. Instructor bio: Danielle Stevenson is a fungi enthusiast living in Duncan, B.C., Canada, with a focus on community-based work towards food sovereignty and land regeneration. She launched D.I.Y. Fungi to offer education and mushroom cultures (a.ka. “spawn”) to empower folks to grow their own food and medicine. She also works on projects and research that address food and waste issues, soil contamination and toxic waste, and works on grassroots and municipal-scale bioremediation projects. This course will introduce the art and science of mushroom cultivation by offering simple, home-scale methods for growing mushrooms for food, medicine and soil renewal. We will focus on growing mushrooms for food and medicine, and working with fungi to build soil, boost your garden, and address soil and water contamination. Throughout this course, you will gain experience and hands-on skills to make grow and make mushroom medicine, grow mushrooms in your garden, digest household waste with fungi, and work with fungi for remediation. Cost: pay-what-are-able but please pay generously between $85-125. or contact Danielle at diyfungivictoria@gmail.com to purchase tickets. This course will introduce the art and science of mushroom cultivation by offering low-tech, low-sterility, home-scale methods for growing mushrooms for food, medicine and earth renewal. We will focus on less-sterile approaches to creating your own mushroom cultures (“spawn”), fruiting mushrooms for food and medicine, and working with fungi to build soil, boost your garden, and address soil and water contamination. Throughout this course, you will learn about setting up cultivation space at home, gathering materials and equipment, and gain experiential hands-on skills to make liquid cultures, petri cultures, grain spawn, sawdust kits, and more. You will learn simple ways to grow and make mushroom medicine, grow mushrooms in your garden, digest household waste with fungi, and work with fungi for remediation. This course is intended for anyone interested in getting to know the fungal kingdom a bit better; folks who want to grow their own protein-rich food; build soil; and/or beginners to mushroom cultivation; and folks who have tried before without success. We’ll focus on Oyster, Shiitake, Lions Mane and King Stropharia mushrooms as easy mushrooms to start out growing, and overview broader options as they relate to medicine and remediation. The course is a sliding scale of $225-300. RSVP required. Buy tickets here. Instructor Bio: Danielle Stevenson is a fungi enthusiast living in Victoria, B.C., Canada, with a focus on community-based work towards food sovereignty and land regeneration. She launched D.I.Y. Fungi to offer education and mushroom cultures (a.ka. “spawn”) to empower folks to grow their own food and medicine. She also works on projects and research that address food and waste issues, soil contamination and toxic waste, and works on grassroots and municipal-scale bioremediation projects. Click here for detailed course info. Participants will come to understand the roles that fungi play in symbiosis, succession and regeneration, and how we can ally with fungi to increase resilience in our living systems and communities.